Jen completed her BA at the London School of Theology and an MA in Christianity and the Arts at Kings College London. She now works part-time as Contemporary Projects Leader at the London Institute for Contemporary Christianity and part time on her own performance art work. Jen lives semi-communally with her church in North-West London. 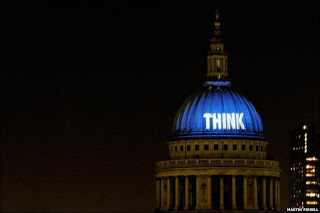 Martin Firrell’s The Question Mark Inside (light-projection, St Paul’s Cathedral, 2008) was discussed during a recent symposium on Art in Sacred Spaces at London’s National Gallery….